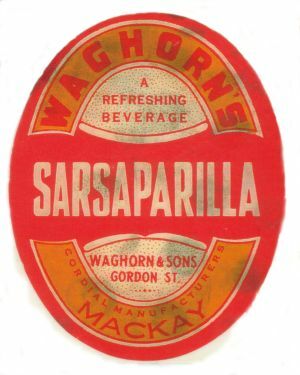 Waghorn and Sons cordial factory was commenced on 1 April 1930 from a factory located at 64 Gordon Street. 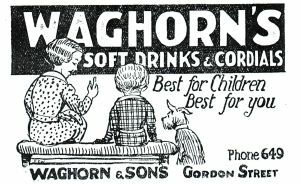 The Waghorn’s took over the business from the Balzer family. 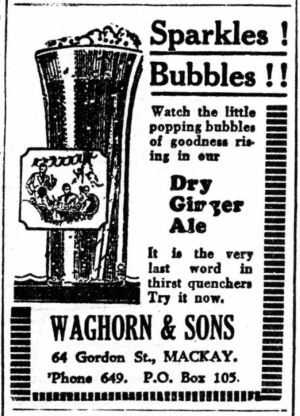 Even though the Balzer's were only in business only 9 months, Waghorn's continued the Balzer's Aerated Waters name for a few years afterwards. 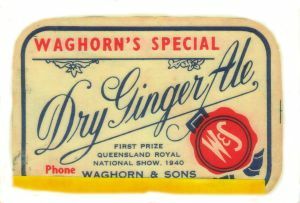 The business won the first prize at the Queensland Royal National Show in Brisbane in 1940 for Waghorn’s special dry ginger ale. 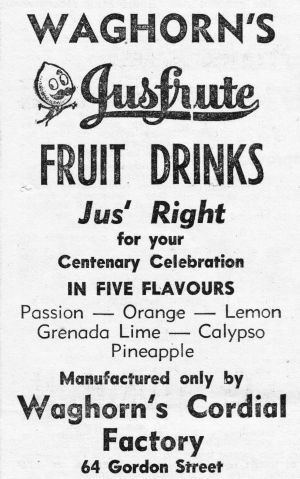 They also held the franchise for the "Jusfrute" drinks in Mackay for many years. 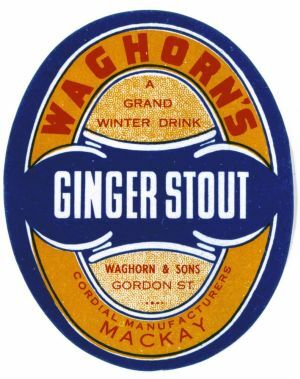 The Waghorn family continued the business until Charles Waghorn, one of the ‘sons’ retired and sold the business to Charlie Takagaki on 1 July 1967. 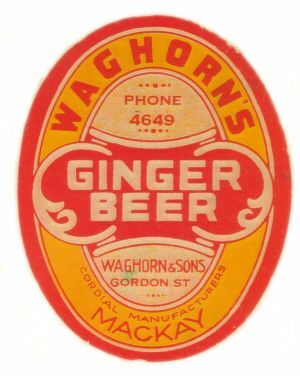 The business continued to trade under the name of Waghorn and Sons and was later moved from Gordon Street to a new factory in Victoria Street in 1979. 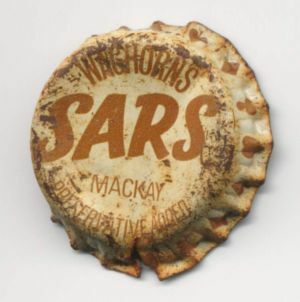 In 1980 the business was taken over by Harrup’s Mackay. The old factory in Gordon Street was demolished in mid 1984 to make way for extensions to New Pioneer Motors caryard. The Daily Mercury, (July 25, 1984), Softdrinks to used cars. p.2. 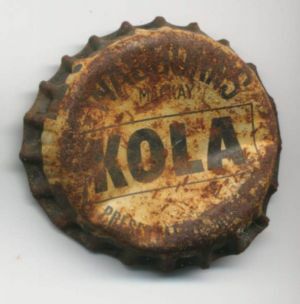 The Daily Mercury, (July 26, 1984), Rare discovery for bottle collector. p.3. 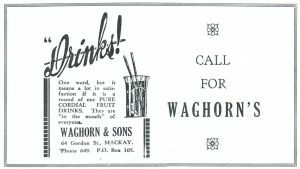 The Daily Mercury, (October 20, 1984), Mr Charles Waghorn dies at 82. The Daily Mercury, (October 12,1988), Man's collection a real bottler. 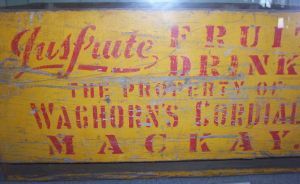 p.2. 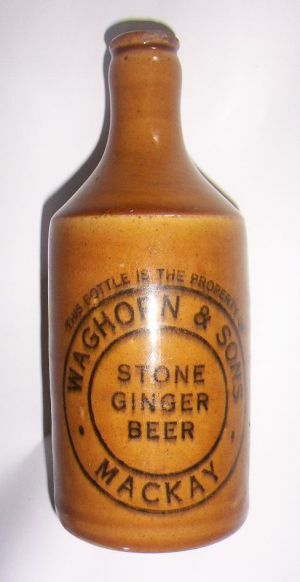 A Waghorns stone ginger beer bottle. 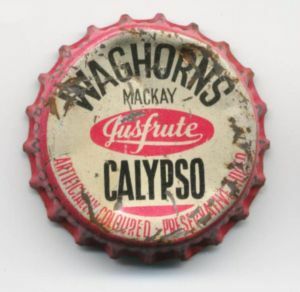 A Waghorns crown cap bottle with star emblem embossed on the bottle. 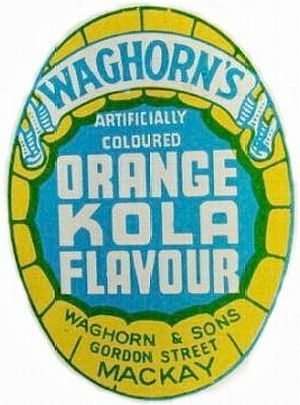 a 10 fl oz glass bottle with enamelled label. 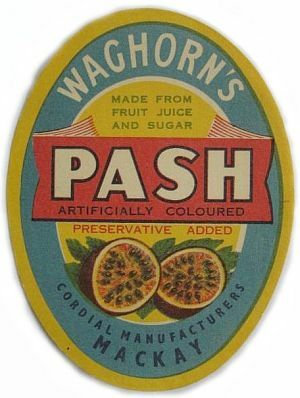 a later 200ml size glass bottle with only the white enamelled label. 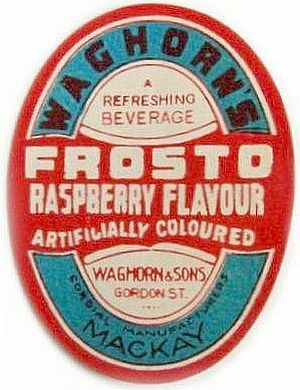 A Waghorn produced Jusfrute bottle. 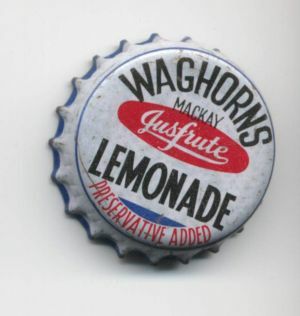 Another example of a Waghorns Jusfrute bottle. 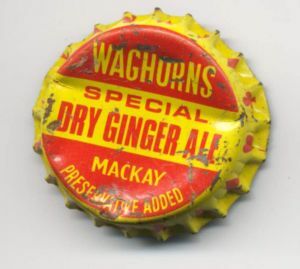 A Waghorn's crown cap A Waghorn's Dry Ginger Ale label c. early 1940's. 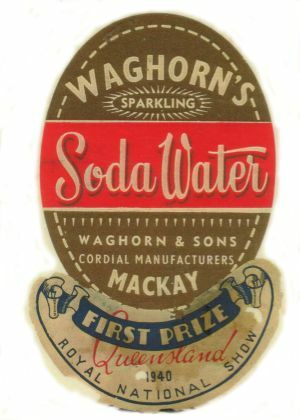 A Waghorns Soda Water label promoting the first prize won in Brisbane in 1940. 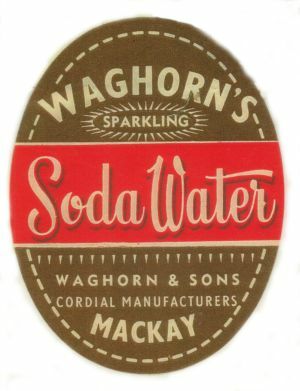 A Waghorns Soda Water label . 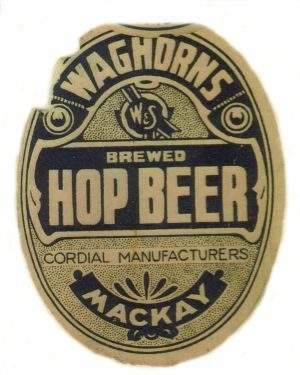 Mackay Tourism and Travel Guide, 1935. The Daily Mercury, April 6, 1962.